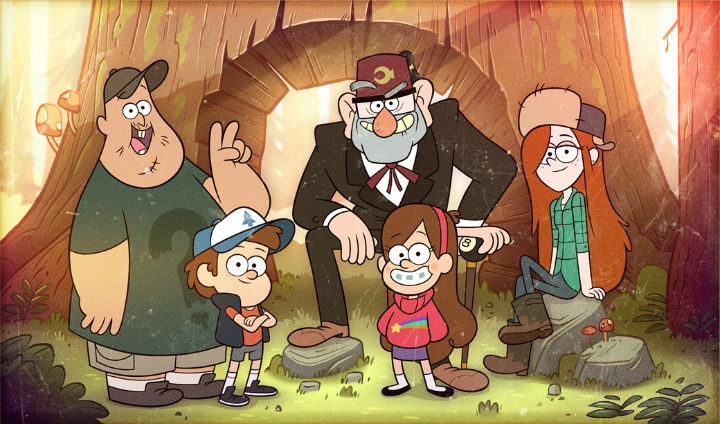 This week’s minorities in cartoons entry is “Gravity Falls,” an animated series that debuted on Disney Channel in 2012. The series currently airs on Disney XD. “Gravity Falls” focuses on 12-year-old twins Dipper and Mabel Pines. The two have been sent by their parents to spend the summer with their cranky great-Uncle Stan, or “Grunkle Stan” as the kids nickname him. Stan runs a second-rate paranormal-themed tourist trap called the “Mystery Shack,” located in the fictional small town of Gravity Falls, Oregon. After the twins arrive, Stan soon has his grand-niece and -nephew working at the Shack. However, the twins soon discover the town itself is full of strange goings-on of the paranormal, supernatural, and monstrous variety, with secrets everywhere. Dipper eventually comes into possession of a journal that describes the various oddities in Gravity Falls. The journal is written by a mysterious author (until the author’s revelation in a second season episode). Said journal helps the twins in dealing with the town’s phenomena. Pretty much every conspiracy theory, supernatural or horror element one can think of has been referenced or parodied over the series’ run. The show overall feels like “The X-Files” meets “Regular Show” or “Steven Universe.” The two twins’ personalities are opposites. Dipper’s serious minded and fairly intellectual, at the expense of not being overly popular. One episode shows he enjoys this show’s version of “Dungeons and Dragons.” Mabel meanwhile is perpetually cheerful, if flaky and non-cerebral. She enjoys boy bands, playing with her pet pig Waddles, and so forth. “Gravity Falls” aired from 2012 to 2016 on Disney XD, attracting both kid and adult fans. Elements that built the show’s popularity include the characters themselves, the series’ strong continuity/running plots, and the mystery/supernatural elements. Soos Ramirez: One of two regular staff members at the Mystery Shack, Soos behaves in an odd, childish manner. That said, Soos enjoys spending time with Dipper and Mabel, and assisting them if needed. Soos lives with his grandmother, who raised him. The other Mystery Shack staff member, a teenage girl named Wendy, is much more level-headed and mature than Soos. Candy Chiu: One of Mabel’s best friends in Gravity Falls; the two share similar interests. Sheriff Blubs: The law in Gravity Falls, Sheriff Blubs and his deputy spend more time goofing off than fighting crime. Dipper is voiced by Jason Ritter. Mabel’s voiced by Kristen Schaal. Soos is voiced by Alex Hirsch. Besides being the creator of “Gravity Falls,” Hirsch also voices Grunkle Stan and several other characters.